May 13 - A group of Peruvian guerrilla fighters, originating in Bolivia, is decimated in Puerto Maldonado (the poet Javier Heraud dies among them). The survivers withdraw into the Bolivian jungle and establish themselves in various clandestine locations. Their incursion as well as their withdrawal are backed by the Bolivian Communist Party (PCB). July - Ché's comrade, the Cuban captain José María Martínez Tamayo (Ricardo), arrives in Bolivia. 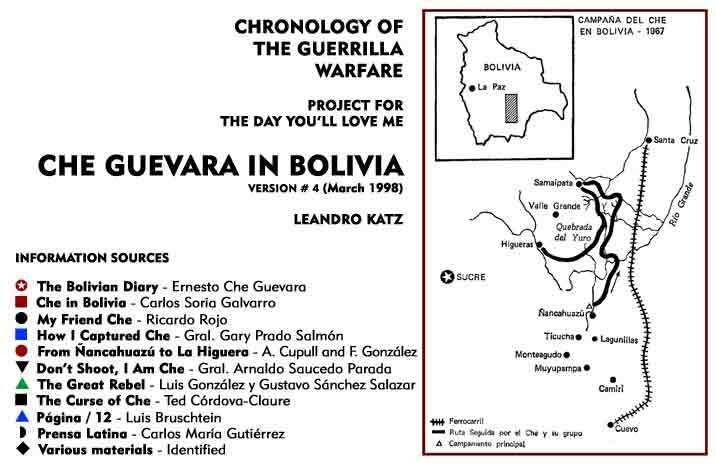 September 63 - February 64 - Under Ricardo's coordination, and with the PCB's cooperation, the rear guard is established on the Bolivian-Argentinian border for The People's Guerrilla Army (EGP), located in Salta and led by Ricardo Masetti (founder of Prensa Latina). November 18 - Tamara Bunke (Tania) arrives in La Paz, her secret mission to infiltrate higher spheres of influence. Tania arrives from Perú in March. Born in Argentina, of German parents who took refuge there from the Nazi repression, she was then about twenty-seven years old. Official sources identify her as Laura Gutiérrez Bauer. International press sources maintain that her name was Laura Martínez, at times known as Emma Gutiérrez in Bolivia, and also known in Santa Cruz as Mary Aguilera. March 14 - Ernesto Ché Guevara, Cuban Minister of Industries, returns to Havana after a four-month journey through Africa. April 1st - Ché writes his farewell letter to Fidel Castro, which is not made public until October 3rd.